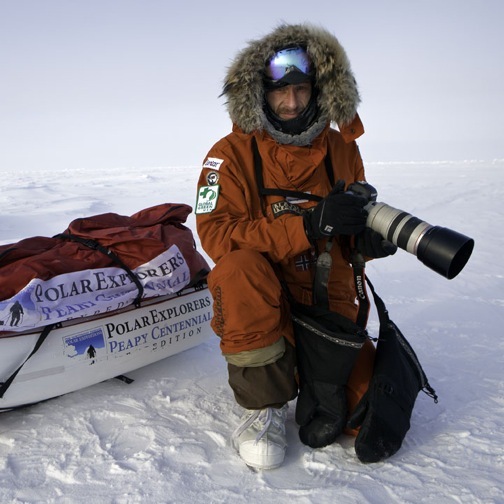 Into The Cold is an amazing documentary that follows nature photographer/eco-advocate Sebastian Copeland and partner Keith Heger on a 2-month, 400+ mile trip on foot to the North Pole. An official selection of the 2011 Environmental Film Festival, the film offers breathtaking views of the unforgiving Arctic wasteland, where temperatures frequently drop below -50ºF, pressure ridges of ice crash together, and the ever-shifting “Arctic treadmill” sometimes causes them to lose a mile while they sleep. 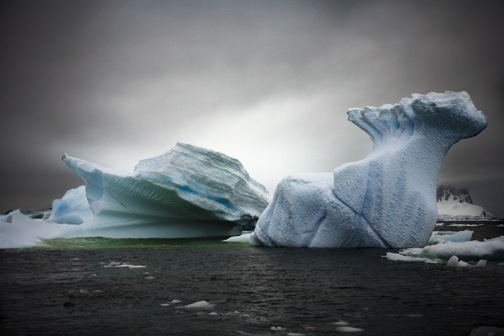 Along the way, Copeland consistently reinforces the notion that he’s taking this arduous journey to draw attention to the fact that the polar ice is melting at an alarming rate and, if global warming isn’t reversed soon, may disappear. We recently scored an exclusive interview with Copeland to find out about his interest in environmental activism, his historic trek, and the future of the Arctic. Your early photography focused on fashion, advertising and celebrities. When did you begin taking an interest in environmental activism? My grandfathers were both early influencers. From my maternal grandfather I learned to appreciate nature. He conducted safaris in India, where he lived. By midlife he’d traded his gun for a camera and, after relocating to Africa, conducted photo safaris in Botswana and Tanzania. He took me with him for long walks into the wild. I took my first pictures of wildlife when I was 12, in Swaziland, and developed an early taste for venturing. My paternal grandfather was a devout Catholic who delivered meals on wheel until he was 94 years old. From him I learned the value of philanthropy. I inherited a penchant for visual arts, and photography chose me. Given my taste for exploring the road less traveled, it wasn’t long before I saw in it a tool to advocate and help people fall in love with their world. People will save what they love. Reaching the North Pole on foot was a childhood dream of yours. What was it about that journey that fascinated you? I had an early fascination for the explorers of yore, and the Poles had figured on top of that list. I dreamed of joining the ranks of Scott, Nansen, Amundsen and Peary. These men easily filled the romantic imagination of a loner child. As soon as I could, I started with mountain and rock climbing, but knew that I would graduate to the Poles later in life. These trips don’t come cheap! Far fewer adventures attempt a North Pole expedition than, say, trying to summit Everest. What deters most sane people from trying, and what compelled you to do it? The Poles are endurance exercises, and require a different type of focus. Weeks of sustained effort with full days of exertion require intense preparation, and result in considerable body mass loss. A long trip to the North Pole with a heavy sledge can add up to running a marathon every day for 5 to 8 weeks! But what separates the North Pole from any other expedition is the added mental challenge associated with the drift. Walking on a thin crust of ice with constant movement makes for trying conditions, namely the “polar treadmill.” It is commonplace to be walking forward while the drift pulls you backwards, losing as much as 30 percent to the negative drift. There’s a constant risk of falling in when ice gives below your feet. 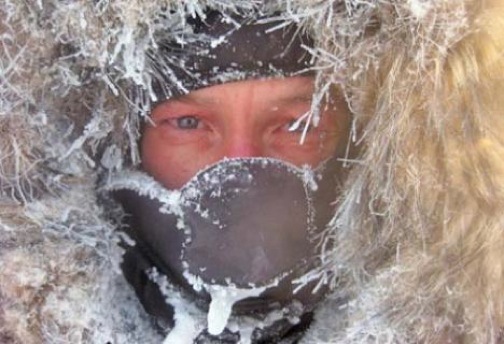 The sum of these conditions, combined with uncertain rescue and very cold and humid temps, add to the North Pole’s reputation of being the hardest expedition on earth. 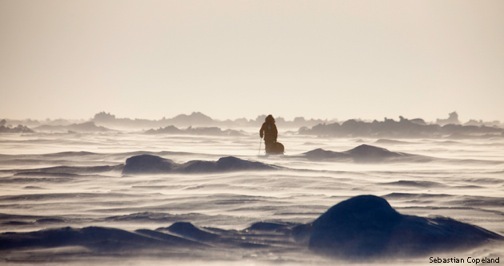 To put it in perspective, less than 150 people have walked to the North Pole. On May 22nd of 2008, 77 people summitted Everest! You made this journey on the 100th anniversary of Admiral Peary’s feat to raise awareness of the effects of global climate change on the Arctic region. Can you explain what’s happening there? The summer Arctic sea faces the threat of being ice-free within the next few years. As it is, just 3% of the Arctic sea is comprised of multi-year ice. That number was 80% twenty years ago. The Arctic has been losing up to a half-million square miles of summer ice each year, which is the size of California and Texas combined. Locally, the longer summers mean tougher hunting condition for bears, as these are their lean months. It’s also tougher on the Inuit, since they hunt more efficiently by traveling on the ice in the winter, where seals are easier to track. We may see the loss of species or cultures as a sentimental tale, and the price of doing business. But they truly are the canaries in the coalmine: As they go, so will we. The warming Arctic means a greater rate of pour from the Greenland ice sheet into the ocean, raising levels globally, threatening massive relocation for coastal cities, flooding low elevation agricultural lands, slowing down the gulf stream and a host of cause-and-effect repercussions. You launched the SEDNA Foundation last year. What are its primary objectives? SEDNA is the Inuit mythical lady of the ice. In folk culture, she threw herself into the frigid waters to avoid a marriage of convenience imposed by her father. She is believed to be responsible for the condition of the ice– good or bad, depending on her mood. My foundation focuses on protecting the polar regions from wanton exploitation made more accessible by the melt. SEDNA advocates from the front lines of climate change and examines partnerships that compel governments to exercise intelligent foresight, instead of short term gain. Why does the U.S. lag so far behind other countries when it comes to addressing global warming? The U.S. has been slow to adapt to new environmental realities primarily because it’s a carbon-based economy. It’s thrived from fossil fuel energy and, as the largest economy in the world, is governed by powerful lobbies. Turning this type of infrastructure around is difficult, especially because with the rising cost of hydro-carbon fuel comes enormous profits. No one wants to face their board of shareholders and advocate for a massive profit cut to invest in the future! Of course, this is neither sustainable, nor healthy for our economy and population. Carbon lobbies are paid handsomely– over $360 million last year, not factoring in the monies spent surreptitiously to influence public opinion and create the illusion that there is a debate on climate change. There are people who think there’s nothing wrong with our global climate. What can average citizens do to help fight climate change? The film paints a grim portrait of the Arctic’s future. Do you have hope that the effects of global warming can be reversed?